For a state the size of Texas, which features hundreds of miles of coastline and dozens of lakes, rivers, and reservoirs, it is only natural that it plays host to some of the nation's best aquariums. Texas is home to a handful of world-class aquariums plus dozens of smaller ones. Visiting one of these top Texas aquariums is a must-do while you're on vacation in Texas. The Children's Aquarium in Fair Park originally opened in 1936 to coincide with the Texas Centennial Celebration, and it's been a favorite Dallas attraction for families ever since. A saltwater selection was added in 1964, and now the aquarium is home to more than 256 aquatic species in several zones: intertidal, near shore, shore, offshore, and stingray bay. And since it is located at Fair Park, where many of the area's festivals and events are staged, it's convenient for anyone attending the State Fair of Texas or other popular events held there. The Dallas World Aquarium opened in 1992 and is in the Historic West End District downtown. It houses five exhibits: Mundo Maya, Orinoco, Aquarium, South Africa, and Borneo. The aquarium features a tunnel that lets you walk through 20,000 gallons of water and get up-close-and-personal with hundreds of Indo-Pacific fish. The other exhibits include birds, animals, sea animals, and reptiles that are part of those ecosystems. The "official" aquarium of Texas, Corpus Christi's Texas State Aquarium houses hundreds of marine species and offers educational programs for more than 500,000 annual visitors of all ages. The Texas State Aquarium has a vast array of displays of fish that are indigenous to the Gulf of Mexico, as well as a few exotic species. Go on a Caribbean journey and learn about the biodiversity of Mexico's Yucatan Peninsula, check out the shark exhibit, play in the splash park, explore a coral reef and see its colorful fish, and visit Caribbean flamingoes. Houston's aquarium features thousands of fish swimming in 500,000 gallons of water, right in downtown Houston. 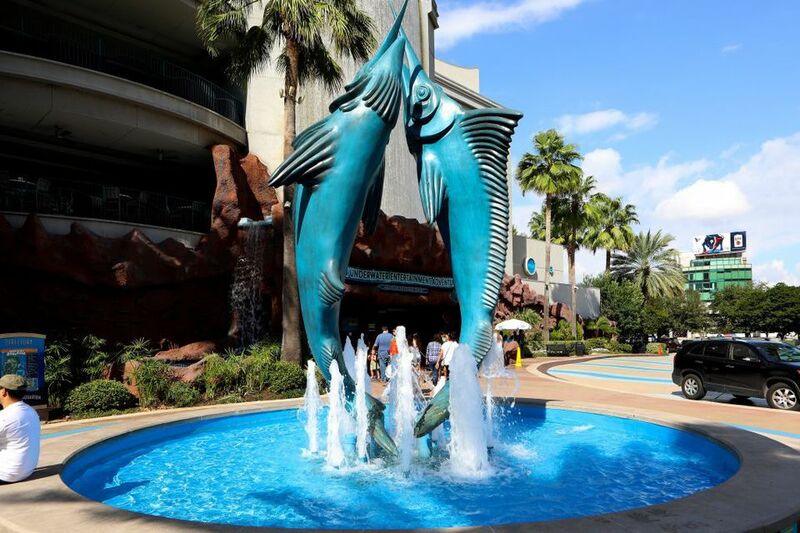 One of the most impressive and exciting aquariums anywhere, it includes games, rides, a restaurant serving seafood (what else) with a view of the wall-to-wall aquarium and a train that travels through an underwater tunnel. Experience the Louisiana swamp, with its alligators, turtles, and bullfrogs; check out the sunken hull of a 17th-century shipwrecked Spanish galleon; and immerse yourself in the rainforest, among several other exhibits. Visitors crossing the causeway to Galveston see pyramids rising on the western side of the island, and those pyramids are actually part of magnificent Moody Gardens. One pyramid houses a rainforest, while the other holds an aquarium. The aquarium pyramid has two viewing areas and tanks depicting four ocean environments—the Caribbean, South Atlantic, and North and South Pacific. It also has a Sponge Bob Square Pants themed exhibit. The Fort Worth Zoo's Great Barrier Reef exhibit consists of more than 500 fish, coral, and sharks housed in 10,000 gallons of saltwater. The collection, which includes 45 fish species and eight invertebrate species, depicts life along the longest natural reef in the world, Australia's Great Barrier Reef.